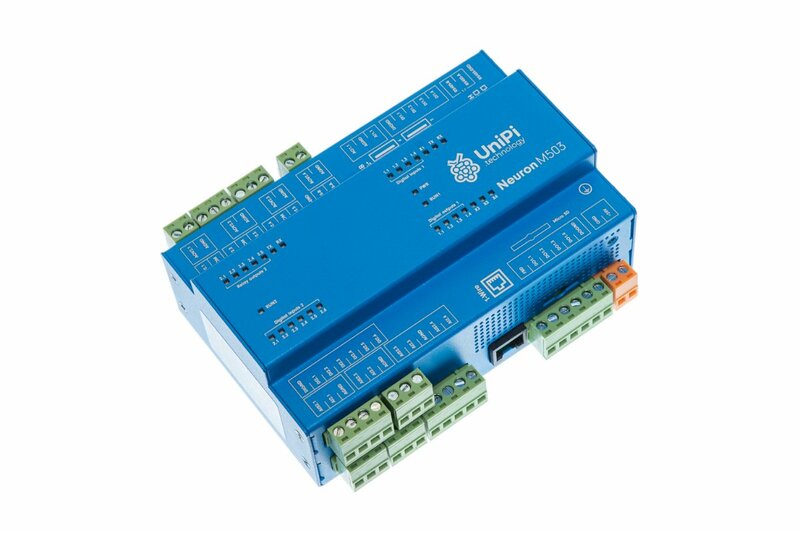 The M503 is a smallest model of the 500 line (consisting of the M503, L503 and L513 models) and as the rest of the 500 line, it features multiple analog I/O modules and additional RS485 universal bus port while retaining a set of digital and relay I/O capability. The M503 represents a smaller variant of the L503 unit. 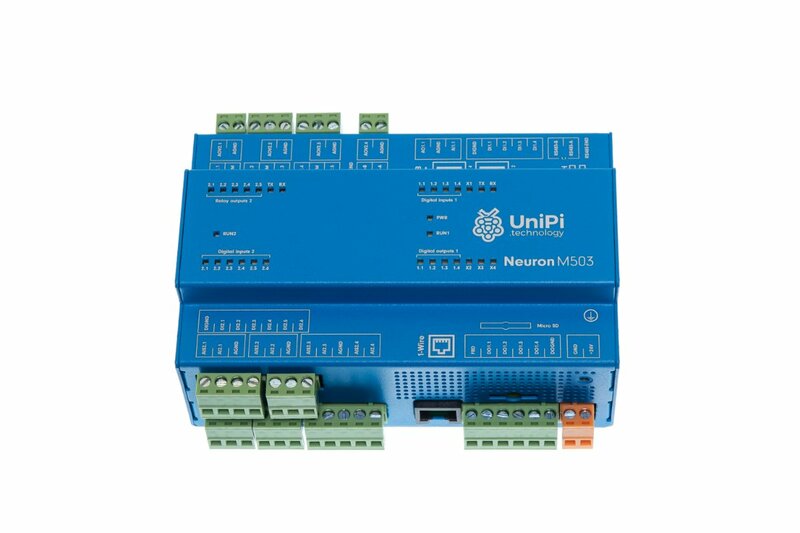 5 analog inputs (AI) can be used for 0-10V DC voltage or 0-20mA current measuring, making them suitable for reading values from analog sensors such as temperature sensors, pressure meters, tensometers etc. 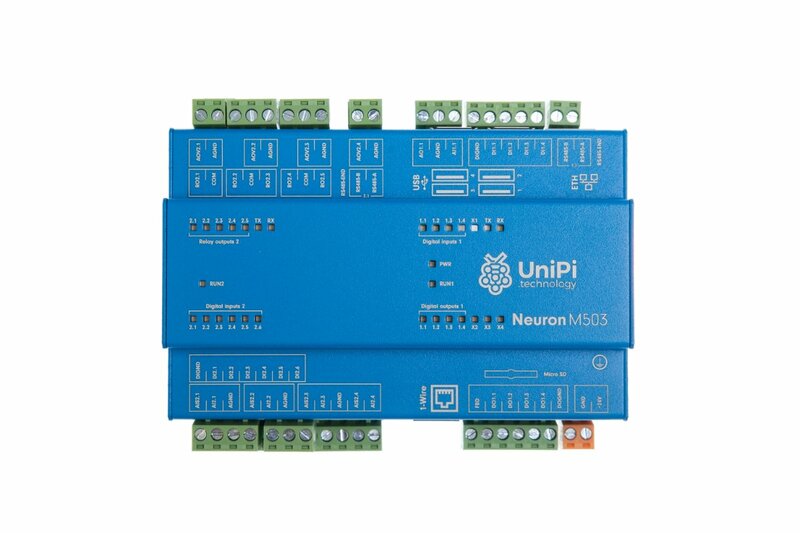 The M503 (as well as other Neuron 500 controllers) is provided with two types of analog inputs. Group 1 analog input (AI1.1) does not feature the option to read data from resistance sensors, it can be however used for voltage or current measurement based on AI register settings. Group 2 analog inputs (AI2.1-AI2.4) then allow the user to perform a precise measurements of voltage, current or resistance based on current output register settings. 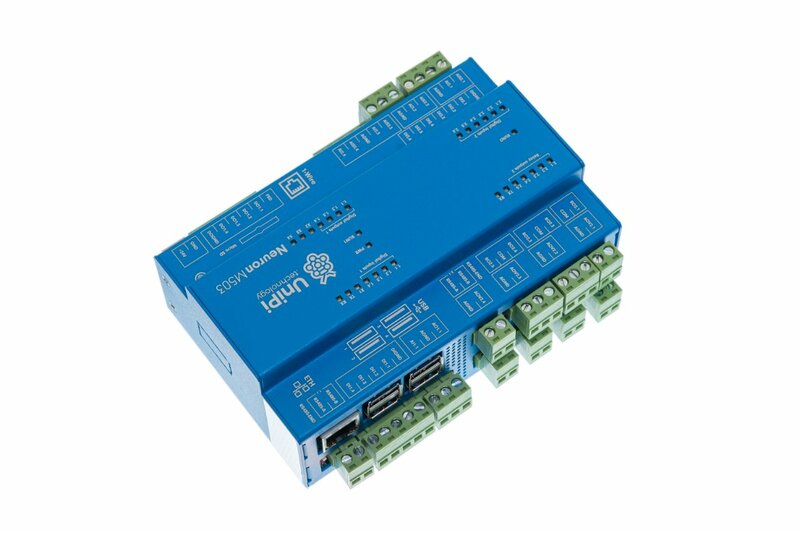 5 analog outputs (AO) feature two modes - 0-10V DC voltage or 0-20mA direct current. AI serves for control of devices with analog input, such as three-way valves, lighting dimmers etc. Group 2 analog outputs of the M503 (AO2.1-2,4) feature 0-10V voltage only. 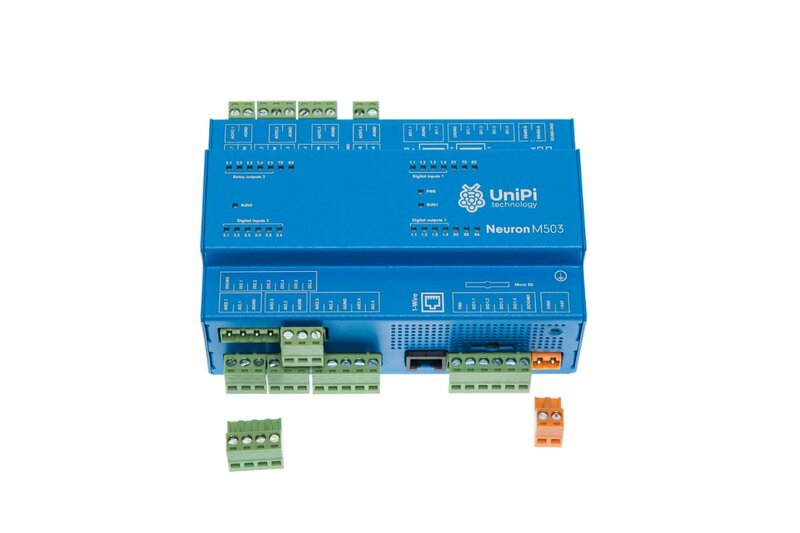 M503 features a pair of RS485 serial lines for communication with external devices or connection of extension modules, most often through the Modbus RTU protocol. 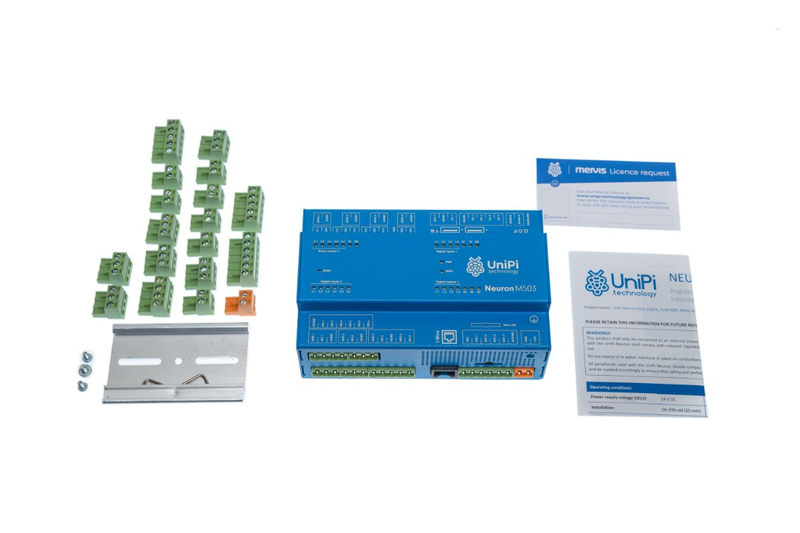 Serial lines can be used for communication with a wide variety of devices such as energy meters, touchscreen HMI panels, PLCs from other vendors or Neuron xS series extension modules) using the Modbus RTU protocol. 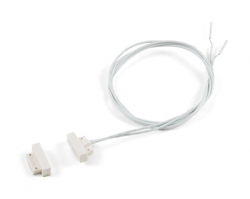 A single RS485 can communicate with a high number of devices with its total length being up to several hundred meters. 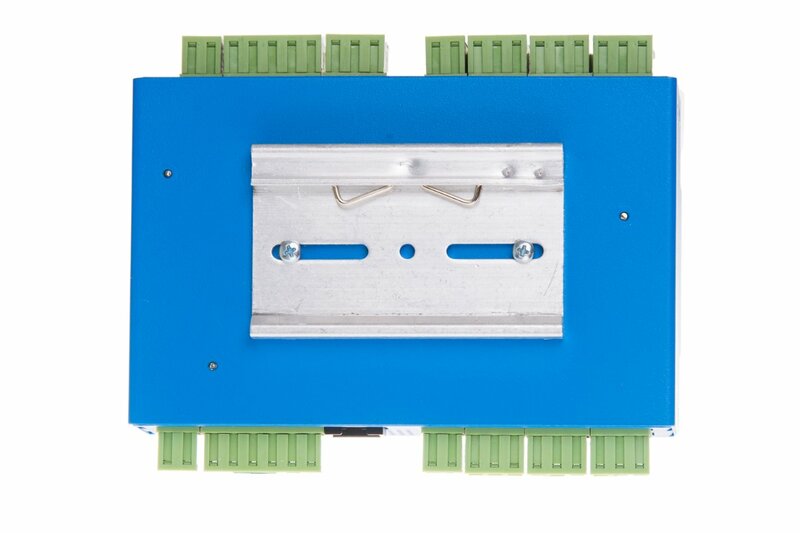 Lines can be also used as an RS485 gateway for other devices or systems,.